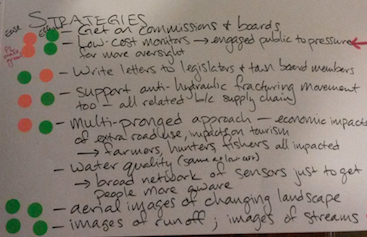 Why (the Situation): Community groups facing an environmental concern need to choose an advocacy strategy. This workshop is designed to help groups identify what advocacy pathways are available, most effective, and that best suit their objectives. When: This workshop is appropriate for a group which has already worked through their problem definition. NOTE: If your group would like to work through creating a Problem Definition together, perhaps Activities 3 & 4 in the Wetlands Toolkit might be a useful reference. Where: in an open room preferably where chairs can be set up in a circle. create a plan to achieve the advocacy strategy. Arrange the room so that there are chairs in a circle. Have a table in the circle so that someone can take notes on the poster board. Ensure there is a place on the wall where the posters can be hung so that people can gather around them and read them together. 3 poster papers will be for activity one and should be labeled one each with: “Stories,” Concerns,” and “Visions” at the top. All papers should have 2 columns down the left hand side approximately one inch or large enough for one dot sticker each. Title one column “Easy” and the other column “Effective” on each paper. The entire right side should be blank leaving room for the brainstorm list. For the activity below, if there are really a lot of people, then as a large group say names only, and then break into smaller groups to do the rest. Think about the environmental issue and share a memory of your experience with it in three phrases or sentences. Describe your concern that has brought you here. Describe your vision that has brought you here. Once you are done sharing all three of theses with the group, take three post-its and write a single word / phrase on each, one that captures your experience, one for your concern, and one for your vision. Everyone go up and place your post-its on the wall under the appropriate heading: “Stories”, “Concerns”, “Visions”. Once these post-its are up, take a few minutes collectively to notice similar types of concerns, and make groupings of common themes. Feel free to ungroup as needed! Also note: not all post-its need to be grouped! Time permitting, stay near the wall and discuss as a group our range of lived experiences and what’s at stake with [your environmental issue]. A motivated notetaker from the group might add post-its to the walls to capture information emerging from the discussion. The facilitator will photograph the wall. This activity involves a brainstorm in which the group will identify all advocacy strategies that have been used in the past or could be used in the future in addressing the environmental concern. "their advocacy of progressive family values"
Advocacy pathways include a variety of actions, like getting media involved, setting up an environmental monitoring program, canvassing to raise public awareness, tabling at events, writing to elected officials, filing lawsuits, educating students on the issue, and more. 2.1: Brainstorm of past strategies (15 minutes) Identify someone who is willing to take notes on the large poster paper. Universities (think social science, health or environmental research, or resources that could be created or used), lawyers, businesses, schools, nurses, etc. In this activity participants will identify which advocacy strategies are or would be easiest, and which would be most effective. For this activity, identify someone who can help to tally results. The group will need to be arranged in a way that everyone can see the board and show their hands so that your tallier can clearly see how everyone is voting. Everyone will vote on each question using their thumbs. Read each bullet (strategy) and have your tally person determine which vote is most popular: easy, somewhat easy or hard, and also which vote is most popular of effective, somewhat effective or not effective. Answers that get easy (or effective) get a green sticker in the columns next to their bullet, answers that get somewhat easy (or somewhat effective) get yellow stickers and answers that get hard (or not effective) get red stickers. Once all the votes have been tallied the group will be able to tell which of the strategies would be easiest and most effective (green/green), and which ones might be more difficult or less effective. Take a moment to discuss with the group the results of this activity. What are we surprised about? Do people agree with the results or disagree on anything in particular, why? Does this inspire us? If so, how? Do the easy/effective strategies help us reach our specific goals? Do we have people who can do them? Does what we outline here effectively use the resources we have? Do we have resources available to us that we haven’t talked about using yet? Would all of these strategies occur in the same timeframe, or could one strategy be the basis for a second one following it? Are there things we could change or do differently? Is motivating to advocates and others impacted by the issue. Does the strategy have a focused goal? If it works, will it provide results that address our issue? Does it allow for everyone to participate in their own capacity? Do we have the resources to do it? Are we motivated to do it? If the answer to any of these questions is no, refer back to the brainstorm and see if any strategies can be changed or adjusted so that the strategy does answer these questions. Using the paper and pens, have everyone take a moment to create a list of tasks that helps to achieve the advocacy goals. Allow time for people to share their lists. After sharing task lists, reflect back to the advocacy strategy you identified as a group. Are there any items, information, or expertise missing from your collective task lists that are essential to complete the advocacy work? If so, reassess tasks lists and make sure to include the missing pieces. Be sure that each person has tasks to which they have identified that they can contribute. As a group, work together to identify the immediate next steps. Select a person to compile the notes of today’s meeting and post them back to the group (for example, as a Research Note on publiclab.org or as an email in the Public Lab regional email list). Identify the next meeting time and place for the group to check in on how the advocacy strategy is going.